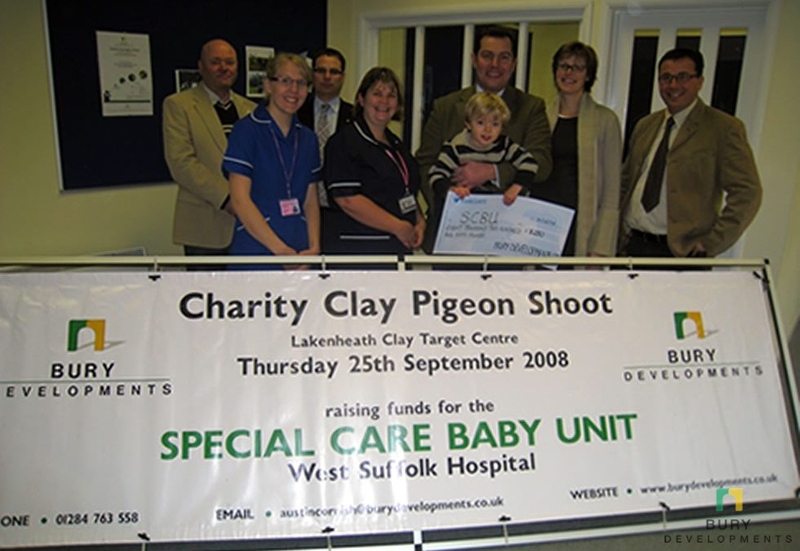 Bury Developments Ltd recently held a charity clay pigeon shoot on the 25th of September 2008 to raise money for the Special Care Baby Unit (SCBU) at the West Suffolk Hospital. The event was held at Lakenheath Clay Target Centre and we had 85 people shooting on the day and a total of 100 for the dinner, auction and raffle afterwards. 8 local companies sponsored different parts of the day. Our auction raised £2000. Prizes included a hot air balloon ride and some days shooting locally. We also had a raffle of donated prizes which raised another £1000. In total we cleared £7500 and this amount was made up to £8250 by Bury Round Table after we arranged the pedestrian fencing for the Abbey Gardens firework display for them. We hope to make the event an annual occasion raising funds for similar charities in the future. The winning team was Landmark Scaffolding from Newmarket with a score of 168 out of 210. High Gun was David Bishop with 40 out of 50. We chose SCBU after my son arrived 6 weeks prematurely and spent 2 weeks on the ward being treated by a very professional and dedicated team. He is now two and a half years old and is in the photo above. Also in the photo are representatives from SCBU, Bury Round Table and Bury Developments Ltd.